As a natural encourager, it’s always my desire to instill hope in the hearts of those who are hurting. Yet sometimes this is harder to do than others. During a recent prolonged bout of illness I found that some seemed to instinctively know how to help, while others did not. Some words and deeds helped, others actually hurt. As I thought about the ministry of Jesus, it didn’t take long for me to realize that Jesus got dirty in doing good. In order to heal, He frequently got His hands dirty – both figuratively and literally. He spit in the dirt and made mud to heal a blind man’s eyes. And it was the Pharisees who became angry that Jesus healed on the Sabbath. They didn’t want to be bothered. Truth be told, they didn’t want to have to get dirty. The #ultimate #gift for a friend in need? The sacrifice #Jesus paid for our #sin. Jesus, being part of the God-head, needed only to say “Be healed” and it would be done, but He often went ahead and did the dirty work for our sake. He made himself an example for us to follow. In fact, He did the ultimate dirty work by making himself the sacrifice for our sin, being beaten and crucified on a cross to pay the price for our sin, so that by His stripes we could be healed. As the hours eeked into days, and the days stretched into weeks that I lay sick and infirm, unable to breathe without struggle, and unable to carry on with my usual routines and schedule, I was forced to not only think about how others had shown love and compassion to me, but how had I and how would I be like Jesus when others were in need? Often, when we don’t know what to do, or what to say, we make the mistake of doing nothing at all. But it’s during those times that our presence or lack thereof is felt the most. 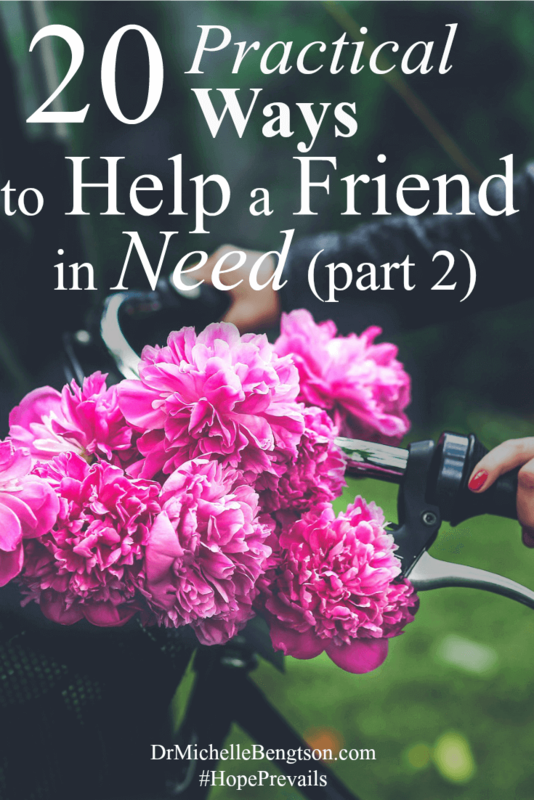 In Practical Ways to Help a Friend in Need Part 1, I shared ways that friends reached out to me during my time of need. I want to offer some practical suggestions for ways to extend help. There are many others. This is just a start. Perhaps it will stir other ideas within you. Pick up the phone and call to check in. Just leaving a cheerful voicemail letting her know you are thinking of her helps. Send a text message asking her how she is. Offer to call or come over to pray with her. Bring a meal to the home. Offer to take her children out after school to keep the house quiet. Bring a fun comedy movie and snacks over as a diversion. Send a handwritten note in a cheerful card. Take a load or two of her laundry back to your place to do, and return clean and neatly folded. Bring or send a bouquet of beautiful cheerful flowers. Leave her an uplifting message on social media for her to find that lets her know you remember her and what she likes. Schedule a coffee date, and if she can’t go out for the coffee, bring the coffee to her. Write out and send her a box of encouraging scripture. Hold her hand or offer a heartfelt hug. The human touch offers tremendous healing properties. Walk her dog for her. Bring her your recent most favorite read. Supply her with her favorite chocolate. Sit quietly with her so she isn’t alone. 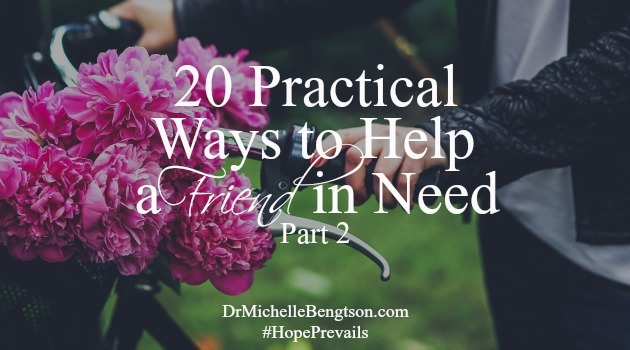 In the comments below I’d love to hear of other suggestions you may have for practical ways to come alongside and help a hurting or ill friend. What have you done, or what have others done that helped you? During my chemotherapy treatments in 2005, a friend brought me a big yellow bag filled with a gift to open each day. This was my “Sunshine” bag. Inside the bag, there were things like – a pack of mints, a cd of soft music, a book of jokes, a devotional, socks, unscented lotion, notepads and pens and so much more. Each day, I enjoyed opening my “Sunshine” gift. I never knew what I would find each day and that brought me great joy. Sometimes we are in such pain or feel so ill that it’s hard to think about what to do to help ourselves. One of my girlfriend’s and I text and/or message about using our essential oils, getting rest, and finding peace. We also remind each other to let our minds rest as well as our bodies. We have been friends for over 30 years and we still do this! It’s our way of reminding each other that even though we are women of influence and encouragers, we still need to be reminded about the things we do when we aren’t ill to take care of our selves when we are. Listening is often the most important thing……………especially listening with the discernment of the Holy Spirit so we can ” read between the lines” and then act on any prompt from the Spirit to do anything practical if we live near by and if we don’t, then being constant in prayer avails much. Great ideas! I remember having a friend come and wash my dishes when I was recuperating from a miscarriage many years ago. Others have brought food, prayed with me over the phone, visited to cheer me…. I’m your neighbor at #TellHisStory. Blessings to you, Michelle! I like your idea of a box of encouraging scriptures! I’ve texted encouraging scriptures to friends or family before, but this takes it a step further. I have a friend going through financial crisis. I’ve helped her with scripture, prayer, paying a bill, helping her fill out job applications online, even driving her places to put in job applications in person so she would have moral support before and after. Michelle, it is so true. Some find it so easy to be present and others struggle, not knowing what to do. This is a wonderful help for all as it may suggest a way we had not thought of yet. Thank you! Thank you for the great list, Michelle! This list could apply equally to stressed-out caregivers (who often don’t even realize how much they need help). 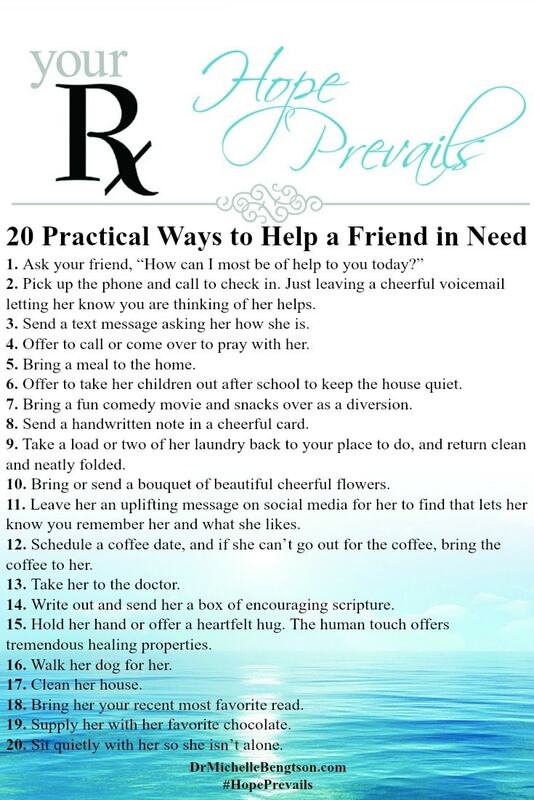 I’ve just pinned your useful list of helpful ways to help a friend… thank you so much. I’m your neighbour visiting today from Testimony Tuesday! Fantastic! Tweeting, sharing, pinning! So glad to find this list! Blessings!